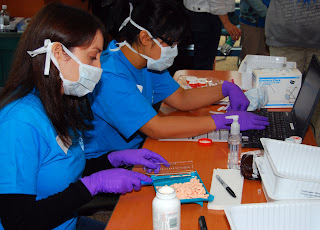 The Unused Medication and Sharps Collection event on April 24 was a big success. Fauquier Health helped the community and environment by collecting 40 gallons of sharps (needles) and approximatley 107 pounds of medications. Organizer Elizabeth Henrickson of Community Outreach wants to express appreciation to Barbara Crierie, Margaret Rowe, Jerry Hansel, Claudia Dornin, Amy Petty, Jeff Iverson, Sanford Reaves, Robert Carroll, Ben Haight, John Williams, Bruce Williams, Deb Berry, Amy Phillips, Mary Barbee, Denise Dewald and the Warrenton Police Department’s First Sergeant Lynne Zett and Detective Brian Kies for their help. Shenandoah University pharmacy students also were valuable volunteers. NOVEC sponsored the event.